Until I moved to live in Spain, January 6th only meant one thing to me – the twelfth night – or, more importantly, the day you are meant to have all your Christmas decorations packed away until next year. 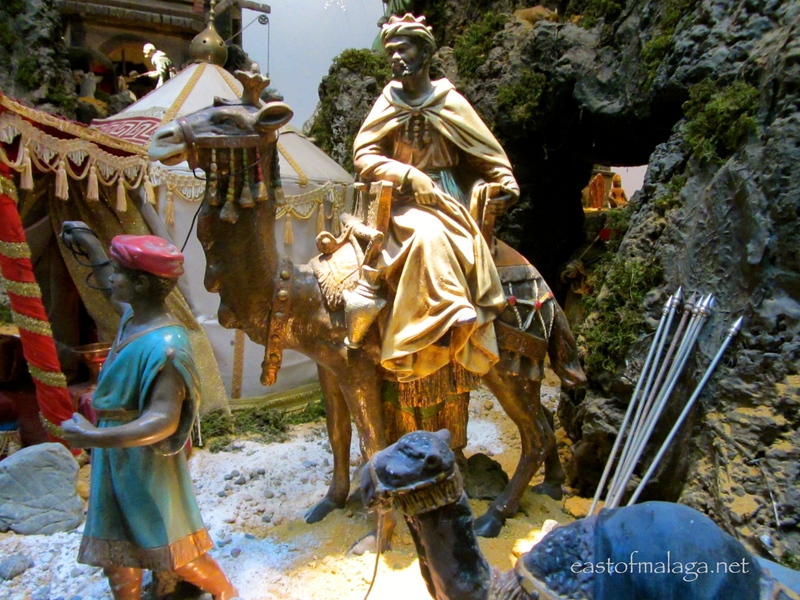 Now, of course, I know that it’s the day that La Fiesta de Los Reyes takes place throughout Spain to celebrate the day the Three Kings arrived in Bethlehem to present the baby Jesus with their gifts of gold, frankincense and myrrh. It is also the most important day for Spanish children, as they receive their festive gifts from the Three Kings rather than Father Christmas (although every year Santa is becoming increasingly popular). The fun starts on the previous evening, usually with processions passing though most towns and cities. During the late afternoon, the crowds grow in anticipation of the arrival of the Three Kings on huge motorised floats, horseback, camels or, in the case of my local mountain village a year or two ago – in the back of a police car! As daylight fades away, you might hear the drums and music of the approaching parade, heralding the arrival of the Three Kings. People on the floats throw boiled sweets towards the waiting crowds on either side. But beware! Some of the younger people on the floats can be rather enthusiastic throwers, with sweets being hurled out like missiles! If you’re not careful you’ll get your eye taken out! Many in the crowd come prepared, holding up-turned umbrellas to catch the booty, whilst others just scrabble around the ground, stuffing the fallen sweets in their pockets or bags. It´s quite a sight to see adults scuttling around grabbing sweets off the floor totally without embarrassment – in fact, it´s easy to get caught up in the excitement of it all! After the parade, most families head home where, before going to bed, the children will put out something nice to eat and drink for the Three Kings, plus water for their camels. They also leave out their best pair of shoes to be filled with presents. The next morning, if the children have been good then they will find presents in and around their shoes, if not, then only a lump of coal will have been left for them – though I suspect that doesn´t happen very often. 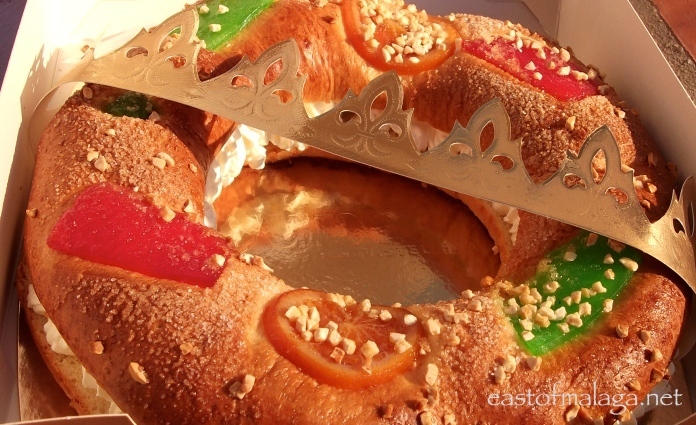 On January 6th, most families gather around the table to enjoy their Roscón de Reyes. This is a ring-shaped bun or sweet bread, sugar-frosted and decorated with fruit flavoured jellies and fruit. The bun is sliced in half and filled with a mock cream mixture. Hidden somewhere in the cream will be a novelty such as small model king and, if you are lucky enough to find one of the hidden figurines in your portion, then tradition has it that you will be blessed with good luck for the coming year. Though I guess it would be bad luck if you inadvertently swallowed it and choked! 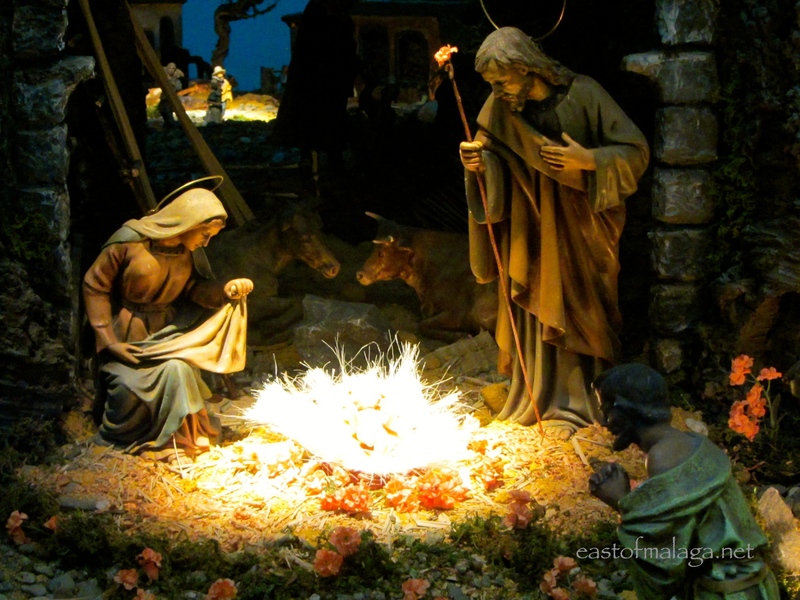 This is also the final opportunity to see one of the many Belénes (Nativity scenes) around the town or city. I photographed this one inside Málaga Town Hall (Ayuntamiento de Málaga) last Sunday. There was quite a queue to get in by the time I left. Which is your favourite fiesta or festival? 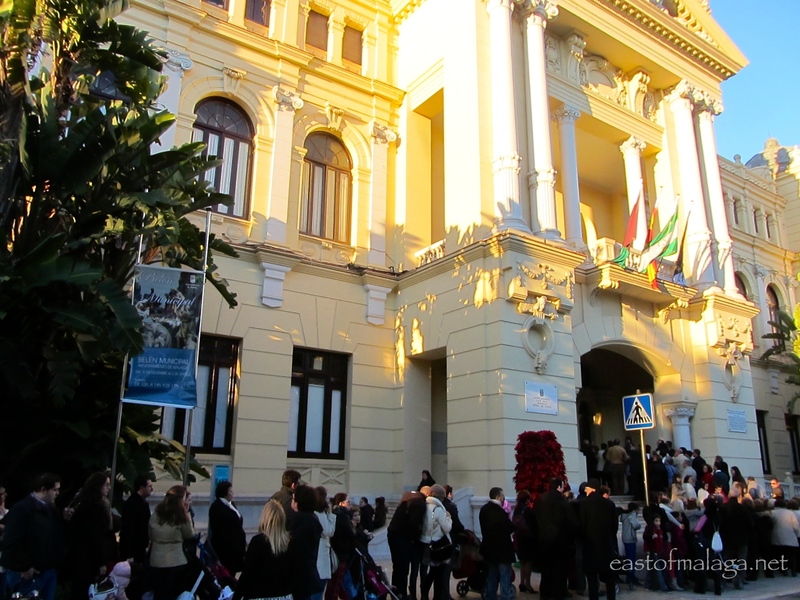 This entry was tagged Andalucía, christmas, culture, customs, East of Malaga, Europe, fiestas, La Fiesta de Los Reyes, life, Malaga, photography, Religion, Spain, Three Kings, travel. Bookmark the permalink. Pingback: And away we go! I managed to find this on a very small scale in the Algarve, at the border town of Vila Real de S. Antonio, Marianne. 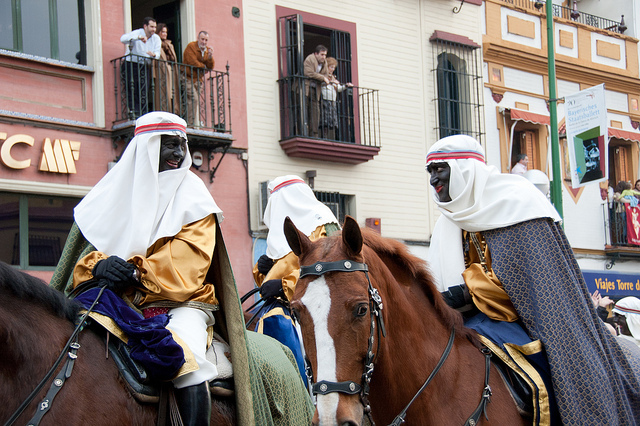 The “kings” ferried across to Ayamonte after distributing sweets to the locals first. It was wonderfully naive. I saw some of the floats at Sevilla online, and that’s a whole different ballgame! I guess the traditions leak across borders, Jo. The ring shaped bun looks delish ! They look tasty, but in my opinion, they don’t taste as good as they look….. but that’s just me! Huh, interesting the three kings in your photo painted their faces black and lips red. In the US, this practice is known as “blackface” and is very controversial because of the history of slavery (there was a whole war fought over it known as the Civil War) and the racist connotations this type of disguise brings up. I know in Spain this kind of thing is not seen as racist because of the country has a different cultural/historical background (though there were African slaves in Spain just like pretty much everywhere in Europe). But I can tell you with 100% certainty this would NOT fly in the USA. Interestingly enough, I read a book about an African American woman’s memoir about studying abroad in Spain and falling in love with a Spaniard and how she viewed the unintentional racism perpetuated in Spain (she did drive me a little up the wall but it was interesting nonetheless). And this is not really criticizing Spain–this topic could probably fill an entire book/be the subject of a thesis dissertation. Have to agree I find the blacking up thing pretty offensive. But equally as laughable in some respects. Here in Granada, and I presume in Malaga too, there are thousands of native Africans who I’m sure, with a bit of encouragement, wouldn’t mind filling in. Not that they seem particularly bothered by the ritual anyway; it is, after all, and as you put it Amelie, a different culture out here. I.e. one where what amounts to casual racism is comparatively extreme in our case. On a lighter note, great post Marianne! Very educative. I had two wedges of roscon this last weekend and won the king on each occasion. Toma ya!! I agree as well. I lived in Malaga and there are plenty of Africans and even Afro-Spaniards that could fill in. I found my self having to explain why dressing up in black face to sing Mowtown was not a great idea for a school festival .I know it wasn’t meant to be mean spirited( I had the nicest experience possible) and all in good fun however it still rubs me a bit. Anywho, thanks for bringing back the good memories of experiencing Three Kings Day. love to learn about this tradition … so sad about the santa thing taking off as a commercial thing allover the planet … I dream of Green Santa next year … no spending, just repurposed, hand-made, local gifts etc … big businesses would not like that at all … Long Live the Three Kings! All the best for 2014 …. and happy travels! I love this idea! Your pictures are wonderful. This holiday is also big in Mexico, but like other countries, Santa is making big inroads. Nice to share this custom and photos with us. Yes, indeed it is, Angeline. Great photos! I learned from a blogger in Ireland that it is also called Women’s Day or Women’s something where Christmas decorations are not taken down until Jan. 6 or else bad luck follows. I always learn from blogs. All the best to you in 2014! Here in France we have the same tradition – today I got a cuddle from a camel on my way home from the butcher’s, because he was waiting for his King in front of the local church (I presume Balthazar had parked him there whilst he had a quick pastis). Tomorrow I’mm be making a “galette des rois” – a flaky pastry tart illed with almond paste and a little seramic figurine. But you can also buy (or make) the same cake as the one you show above – but without the filling. I hope you have a lovely day and be careful not to swallow the ceramic figurine! Fascinating celebration and great photos too. Thanks Sue – oh yes, always great fun! fabulous photos, I had heard that this is the big day in Spain, rather than Christmas Day. Sounds like a great festival. I think Christmas would be my favourite festive time, closely followed by Easter, with the summer to look forward to. might be a good time to visit then? Marianne, I’ve just blogged about how the French celebrate this fête and enjoy their La Galette des Rois. I’m going to go back to my post and link to yours as well so my readers can learn about the celebration in Spain. This is what I LOVE about life in western Europe. There’s always something special happening! Good luck in receiving the lucky slice and be careful how you chew! As always, fab photos! I’ll come over and take a look at your post …. Marianne what a fabulous post! Is that Snow White in the photo with the children? Is she lost? 🙂 Oh my goodness I laughed at your comment about it being bad luck if the hidden figurine was swallowed…worse luck if choked upon! Yes, I believe it IS Snow White. 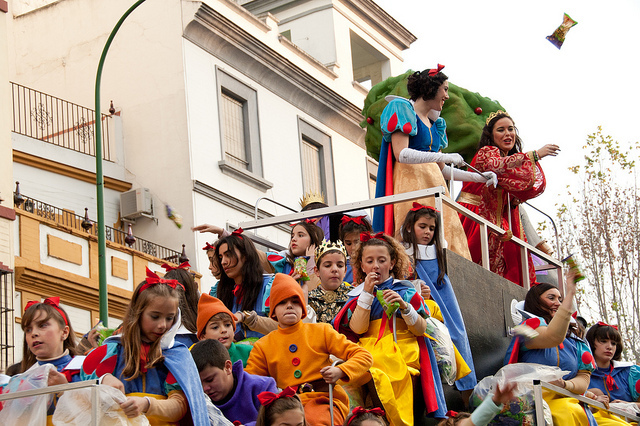 Many of the floats have nothing to do with the Three Kings – maybe it depends on which costumes they have to hand! Hahaha … thanks for your comment, Sue. Much appreciated.